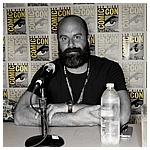 As in years past, we had boots on the ground at the biggest pop culture event of the year! Below is our complete coverage of the 2017 San Diego Comic-Con collected on one page. Scroll down to check out what was announced and shown! Not Just Costumes & Armor. 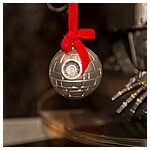 Now You Can Be A Wookiee! 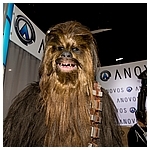 No, your eyes are not deceiving you, that is a deluxe Chewbacca costume on display at ANOVOS' 2017 San Diego Comic-Con booth! 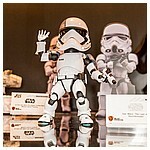 This new wearable collectible is amazing, and event photography cannot even come close to showing you how awesome it is. Don't let that stop you from clicking on the images above to have a closer look at it and everything else they had out! 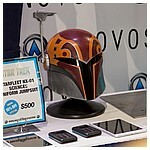 During their portion of the Star Wars Collecting Update panel, ANOVOS announced their Rebels Sabine Wren Season 2 Mandalorian helmet and offered more information on the Definitive Mandalorian Jet Pack Kit, which was announced last April during Star Wars Celebration Orlando 2017. Both these items were added to their booth. Click the thumbnails above to have a closer look. 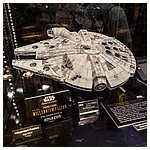 Bandai Hobby Reveals Awesome Millennium Falcon Model! 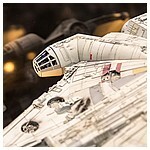 Bandai Hobby's Star Wars model collection has hit a new level of awesome with the insanely cool 1/72 scale Perfect Grade Millennium Falcon model. 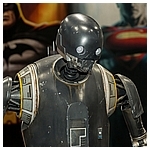 Click the thumbnails above to have a closer (totally drool-inspiring) look at the models they had on display in their 2017 San Diego Comic-Con booth! 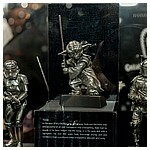 Tamashii Nations Displays Their Growing Movie Realization Collection! 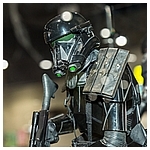 The Movie Realization Shadow Trooper was put on display in the 2017 San Diego Comic-Con Tamashii Nations booth. 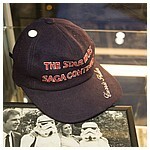 Click the thumbnails above to have a closer look at it and all the other Star Wars items they had on display. Many New Items Revealed At Two Booths! The Beast Kingdom booth had a few surprises. The first was a new exclusive that you can order through the Diamond Previews catalog at your local comic store. It is a two-pack of chrome R2-D2 and gold C-3PO from The Force Awakens. 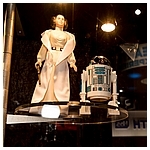 The R2-D2 comes with a Princess Leia hologram (not pictured) and both characters feature the same amazing light function that the regular set has. The second item we noticed was the Executioner Stormtrooper from The Last Jedi. Beast Kingdom employees told us the figure comes with a shotgun but they did not have it at the show. The last surprises we found at the Diamond Previews booth across the way, giant versions of the Darth Vader and Stormtrooper statues. 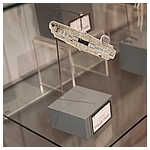 These light up and are made of hard plastic vice the ceramic of the smaller versions. 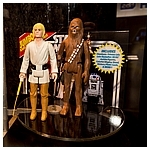 The folks from Diamond were not certain but thought the R2-D2 and C-3PO statues were also made in the large format. No indication on the pricing at this point. 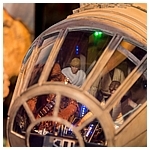 Beast Kingdom had a secondary display at the Diamond Previews that included the prototype floating light up BB-8, the new Rogue One/ A New Hope Darth Vader, the Rogue One Stormtrooper, the Scarif Stormtrooper, and the light up Death Trooper. 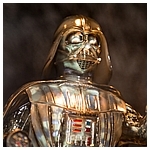 Darth Vader mostly differs from the previous model with a different colored chest box (the cape is mistakenly under the armor, probably due to early production materials Beast Kingdom received). 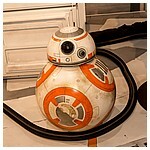 The character still features a light up chest sequenced to match the movie. The only difference with the Stormtrooper is a new pistol and a sand paint scheme from Jedha. We spoke with some Beast Kingdom reps about the Star Wars license and where they plan to go from here. 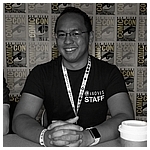 When we asked about characters showcased at New York Toy Fair or previous San Diego Comic-Cons, they told us that sometimes they put out prototype characters to gauge interest. 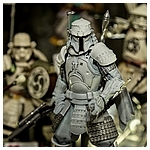 For example, they showcased a Boba Fett, Jango Fett, Captain Rex, and different ranks of the Phase I Clone Trooper at New York Toy Fair last year. No word on how they are gauging consumer interest because they do not regularly track the fan sites and have no way of communicating with customers other than Facebook. Regarding communication, Beast Kingdom reps said that they are working on a website that should launch in October and allow customers to buy directly from them. They were not clear on if this site would be in english and aimed at the American market but to the best of their knowledge they made it seem like they are trying to target a North American market. 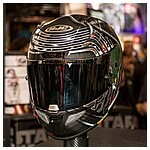 Taking Our Breath Away One New Helmet At A Time! 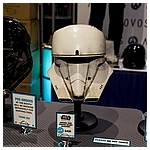 Collectors made their way to EFX Collectibles' 2017 San Diego Comic-Con booth throughout the event in order to get their hands on the company's stunning 40th Anniversary commemorative Darth Vader helmet, and found the public debut of the long-awaited Boba Fett helmet as well as a special showcase featuring the melted Vader helmet and Kylo Ren's Lightsaber hilt from The Force Awakens. EFX has announced their interest in offering fans an opportunity to add 1:1 scale replicas of the Episode VII props in the wake of Propshop's bankruptcy. 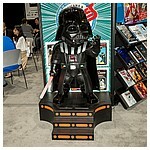 There were some cool new items revealed in Gentle Giant Ltd.'s 2017 San Diego Comic-Con booth including the Return Of The Jedi Darth Vader (actually, at this point Anakin Skywalker...) Mini Bust with awesome light up Sith Lightning illuminated innards, the fully painted Rogue One K-2SO statue, as well as the Jumbo Kenner Luke Skywalker (Stormtrooper Disguise) and Early Bird four pack that includes a 1/6 scale replica of the classic Kenner cardboard display along with rereleases of the Princess Leia Organa, Artoo-Detoo (R2-D2), Chewbacca, and Luke Skywalker action figures. The Luke in this set will feature a double telescoping Lightsaber. We suggest to them to give Chewie a green Bowcaster, but we'll have to wait to see if they will produce that color of the Wookiee's go-to weapon of choice. 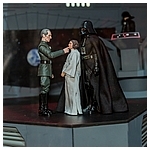 Our San Diego Comic-Con coverage continues from a much needed breather with a gallery showing off the two new pieces Gentle Giant Ltd. revealed in their booth after the Star Wars Collecting Update panel. 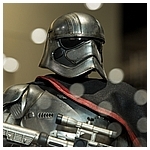 Click the thumbnails above to have a closer look at the Premier Guild exclusive Holiday K-2SO Mini Bust and Jumbo Kenner Emperor's Royal Guard. While we're certain you only need one of the former, try to tell us you can live with anything less than six of the latter! Preparing to wow the Preview Night crowd, Hasbro had a massive 40th Anniversary 6-inch display that accurately depicted many key scenes from A New Hope, none of the components are designed for sale (same goes for the compactor Luke at this time...). 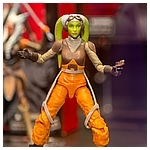 For new items on display, they had out the redone The Black Series Hera Syndulla 6-inch figure, the SDCC exclusives, the Hero Series Yoda, the Universe Han Solo VS Boba Fett 3.75-inch two pack, and the Ahsoka Tano Forces Of Destiny doll. 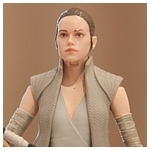 Hasbro held their annual Brand Preview Breakfast on the first morning of San Diego Comic-Con 2017 to show-off some of their forthcoming product, including a first look at their new Rey (Resistance Outfit) 6-inch figure featuring a phenomenal head sculpt that utilizes a new process. Andy Ochiltree (brand marketing) opened up the session and introduced his team. 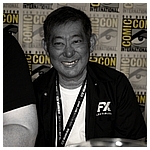 He discussed the phenomenon that was Force Friday in 2015 and how he expects it to be even bigger this year. There is no news for Force Friday 2 at this point but he said there are a fair amount of announcements forthcoming as we get closer. Andy opened and showed off all the convention exclusives that were available for sale to attendees. 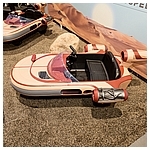 He highlighted what sets the SDCC version of Luke Skywalker's Landspeeder apart from the version available for wide release in the fall. 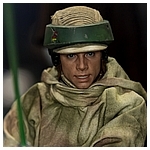 The SDCC version features premium packing (one of the finest quality packages Hasbro has produced), finer quality tunic on the soft goods, and more deco in the engine as well as moving parts. 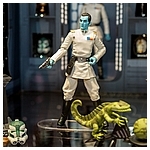 The obvious difference with the Grand Admiral Thrawn exclusive is the accessories, once again Hasbro drew attention to the holy grail. Patrick Schneider (brand manager) introduced The Black Series Rey's Force FX Lightsaber. He noted how this slightly differs from the Luke Skywalker Episode IV version. 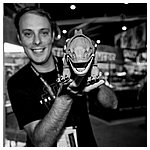 Next Steve Evans (design director) spoke about that awesome diorama you were all admiring in our photo gallery. He noted the hundreds of man hours between builders that went into this sets. Sam Smith (design manager) explained that the diorama tells a story and has a clear start and end. Hasbro used their 3D printers but had to work in between times the printers were used for normal business functions. He talked a little about the Millennium Falcon and mentioned how it was composed of more than 60 sections and featured a fiber optic cockpit where every switch lights up. Hasbro began a fun game of what's missing from the diorama. Audience members correctly guessed, the Rebel Fleet Trooper! Hasbro showed us the new design for the character that will be available in late 2017. 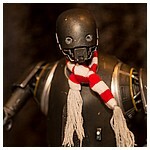 He will have a removable helmet and include the Death Star data card from Rogue One. Continuing with the game, Hasbro focused on the sandtrooper scene and asked what was missing again. 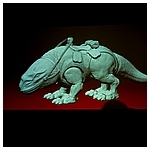 Some people wondered if it could be Owen and Beru, some thought perhaps the Krayt dragon, and others correctly guessed the dewback! This guy will not be available until 2018. He has an articulated mouth and tongue! 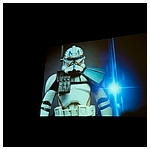 Hasbro then showed a fan request favorite... Captain Rex Phase II! 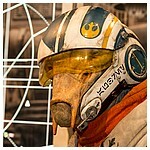 Describing the detail, Hasbro noted the weld marks on his phase 2 armor and the kill count on his head. He also has a removable helmet. 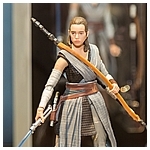 Hasbro also showed us the new The Force Awakens Resistance Base Rey side-by-side with Captain Rex to show off the new face molds based on scans. 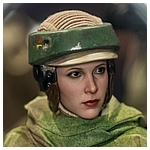 Hasbro had some photos of Leia in various costumes including Leia Hoth, Endor, and General. Hasbro made mention to say that there are a lot of great designs to work with, suggesting we may see some of these in the future. 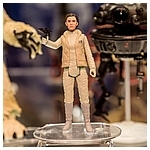 Hasbro then showed us the new General Leia figure that features a removable jacket. 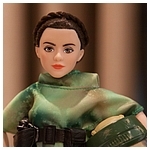 Hasbro rounded out the six-inch segment with the reveal of The Force Awakens Maz Kanata. 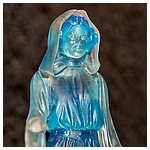 This figure includes an openable chest with details inside and a removable lightsaber. 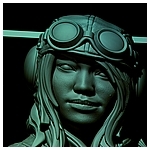 Her goggles also articulate and move on and off her eyes. Kevan Maciver (global brand team) and Sam Smith opened by introducing Hoth Lea. They immediately said this was part of a Hoth theme. 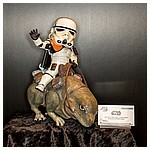 Next up was Hoth Luke Skywalker with articulated wampa featuring removable arm and then Darth Vader and probe droid. 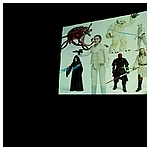 In the same slide, Hasbro officially unveiled the Rathtar, who jokingly escpaed his cage early at SDCC preview night, then showed us the Han Solo and Boba Fett two-pack, and Qui-Gon Jinn and Darth Maul two-pack featuring articulated wrists and a break apart saber for Darth Maul. 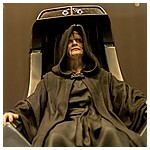 Lastly, a final addition of Emperor Palpatine featuring a PVC cloak and swappable lightening hands. Chris Dern (Lucasfilm licensing) showed us The Vintage Collection promotional video from Star Wars Celebration while Patrick handed out tissues to the crowd (not a joke, he really did this). 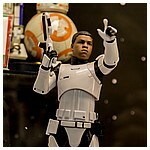 Once again he reminded us that the figures will be super-articulated. This series will feature classic characters that have not yet been done, reissues of characters of unmet demand, new characters from new films, and repacks of characters from the classic and modern super-articulated lines. Steve then chimed in and said this line will be about a conversation with the fans. Hasbro wants to know what things we want. He said he checks certain websites and forums every morning. Steve reiterated that he wants to plan this line with fans and not for them. He then noted that Rey will be the first character in the line VC116. Not numbered but also part of the line will be Kyle Ren, First Order Stormtrooper, Doctor Aphra, and Rebel Hoth Trooper. 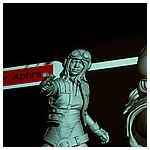 Hasbro is still finishing the sculpts on Doctor Aphra but noted that she will feature a removable vest. The Rebel Hoth Trooper is from the Legacy three-pick and will not feature a beard. There are also five figures based on the new movies (possibly The Last Jedi) that were mentioned but not revealed. Next were shots of characters from Rogue One including Jyn Erso, Cassian Andor, a Death Trooper, and a Assault Tank Driver. The package will feature a double chrome bar. Hasbro then noted that the line will feature vehicles as well with vintage-style boxes. First up will be the Imperial Assault Tank in 2018. 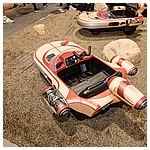 Hasbro noted that the vehicle may not include figure because all of the money for the production was put into the design. It is made to the correct scale, features working treads, and is super detailed to the point of including a coffee cup for the tank commander (no joke it was in the Lucasfilm archives). At least one of the containers on the back opens up exposing the kyber saber containers, which also open allowing you to remove the cores. 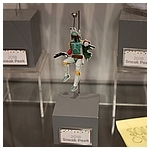 These items were not available for display but a Hasbro rep seemed to indicate that we will see these in New York either at Comic Con or Toy Fair. Emily Cantelupe (senior product designer for the Force of Destiny line) opened up by highlighting the features of this 11-inch line. 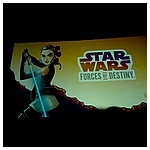 She discussed the action features in characters like Rey that has a lightsaber slashing feature when you squeeze her legs. Next up was a Padmé Amidala reveal featuring her pilot costume from Attack of the Clones and blaster pointing action feature. 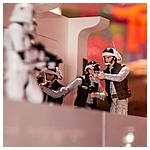 Following their Star Wars panel, the team at Hasbro went to work adding new figures to both their display shelves and diorama. Click the thumbnail above to have a closer look!! 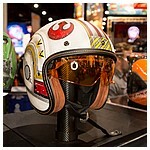 New Star Wars licensees, HJC Helmets made made their public product display at the 2017 San Diego Comic-Con with a total no-brainer line of total awesomeness! 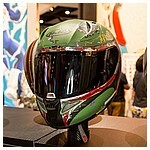 The first assortment of DOT motorcycle helmets includes buckets featuring designs influenced by Kylo Ren, Boba Fett, and Luke Skywalker's iconic helmets along with an early look at their upcoming generic Rebel helmet. 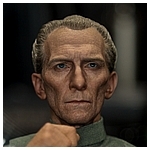 Hot Toys Continues To Blow Our Minds! 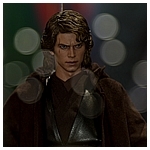 Hot Toys left many a mouth agap with their new product reveals in their San Diego Comic-Con display including the Revenge Of The Sith Anakin Skywalker (!!! ), Return Of The Jedi Luke and Leia Endor Battle Gear, Rogue One Imperial Tank Commander Stormtrooper, Return Of The Jedi Emperor Palpatine with Throne, A New Hope Grand Moff Tarkin with Chair, Holiday Special Boba Fett , and the first North American public showing of The Empire Strikes Back Princess Leia Organa in Hoth Battle Gear. Click the thumbnails above to view this massive gallery of must-have goodness! 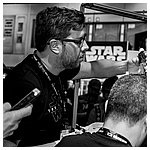 Announcing at the Star Wars Collecting Update that they are focusing on new products for The Last Jedi and the Untitled Han Solo feature films which are under embargo, the Star Wars section of Kotobukiya's 2017 San Diego Comic-Con booth served as a reminder of what is currently available and what is coming soon. 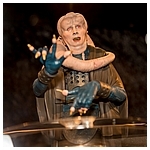 We love their ARTFX and ARTFX+ statue lines, so we were cool to see what was on display. 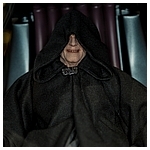 Eagle-eyed collectors keeping track will note that this event marked the first North American public display of the Emperor Palpatine ARTFX+ paint master. 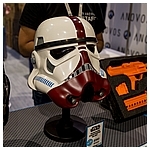 With so much attention being laundered on superheroes and Ninjago, LEGO has finally revealed their Star Wars contribution for San Diego Comic-Con. 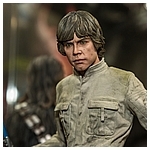 Sadly it's not going to fit into anyone's suitcase because this 36 thousand+ brick model of Luke Skywalker is life-sized and weighs an estimated 110 lbs (50 kg). Inspired by his iconic costume and stance in The Force Awakens this build will deliver the exact same glowering performance as its live action, on-screen counterpart. 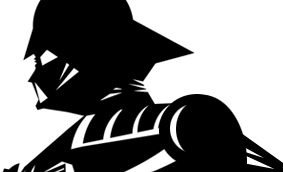 Close your eyes, breathe and click on the thumbnail - what do you see? Got The Time For More Star Wars? So Much Cool. So Much Awesome. 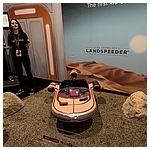 Part of the Lucasfilm Pavilion at the 2017 San Diego Comic-Con, the PopMinded By Hallmark booth saw a lot of foot traffic with collectors curious to see what they had on display and to get their hands on the event exclusive classic Kenner inspired itty bittys Walrus Man, T-70 X-Wing Fighter Keepsake Ornament, and the Imperial R2-Q5 perpetual calendar. Click the thumbnails above for a closer look at all that they had on display! 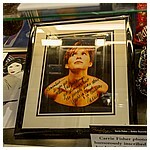 Attendees of the 2017 San Diego Comic-Con flocked the Profiles in History booth to have a closer look at the Carrie Fisher Estate items they were preparing to put on the auction block. Click the thumbnails above to view the gallery showing everything displayed in the booth! 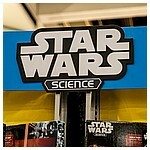 New Star Wars Licensee That Shows Us How It's Done! 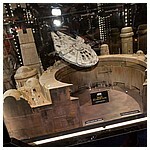 One of the biggest surprises and most talked about thing on display at any Star Wars licensee's boothClick the thumbnails above for a closer look! Pew! Pew! Pew! Return Of The Pewter! 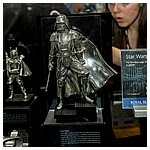 Royal Selangor's Star Wars collection made its San Diego Comic-Con as part of the Sideshow Collectibles booth. 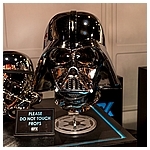 On display were their Darth Vader, Stormtrooper, Yoda, Boba Fett, R2-D2, BB-8, Kylo Ren, Princess Leia Organa, TIE Fighter, Millennium Falcon, and Lightsaber collectible Pewter Collection items. 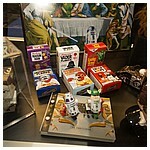 All Scales Of Star Wars Goodness Was On Display! 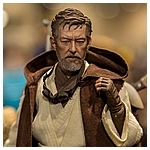 Sideshow Collectibles had many Star Wars items on display in their 2017 San Diego Comic-Con booth, but of them all, we were most impressed with the Sixth Scale Mythos Obi-Wan Kenobi figure they added to the display after the Collecting Update panel. The Annual Panel That Revealed What's To Come! 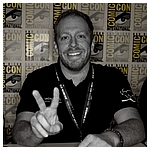 Every Friday at San Diego Comic-Con is known as Star Wars Day, and even though Disney and Lucasfilm seemed to downplay this tradition in 2017, the traditional Star Wars panels kept fans and collectors glued to their uncomfortable seats in Room 7AB. 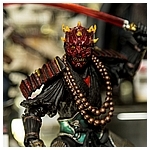 This year's Star Wars Collectibles Update panel featured presentations from Nixon, Sideshow Collectibles, Kotobukiya, Gentle Giant Ltd., EFX Collectibles, Tamashii Nations, Bandai Hobby, and ANOVOS. 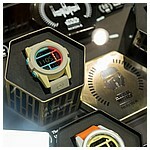 Nixon began the session by explaining how they strive to capture character details in their watches. 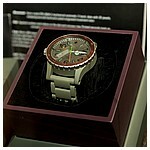 They showed us the Swiss made Boba Fett special edition of 100 watch. It comes in a case and sits in a sarlacc pit within the case. 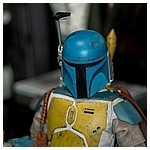 It includes such details as Boba's blaster as the second hand. Retail is about $2500. 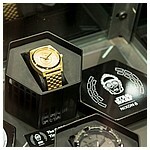 There is a digital version that sells for $150 and included such fun detail as Han Solo in carbonite on the wristband. 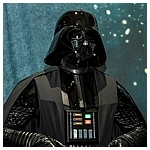 The Darth Vader watch draws a kit if éléments from his costume. For example, you can see his face mask vents on the clock face, The dial is a hyperbolic chamber and the box is also his meditation chamber. Sideshow relayed to us that they are always looking for scenes in the movies that capture the essence of a particular character and freeze the facial expression. 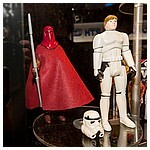 Sideshow showed us some new statues including a new stormtrooper with a fabric suit and a prototype Princess Leia. Next we got a look at some upcoming life-size units including the Return of the Jedi version of Boba Fett and a stormtrooper. Both feature new bases, as will the entire line. 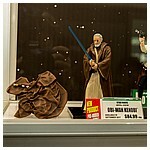 Lastly, Sideshow announced the return to the mythos line and showed us an Obi-Wan Kenobi from prior to A New Hope. 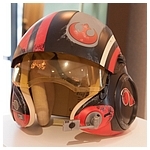 The piece included elements from his time in the Clone Wars and wandering around Tatooine. 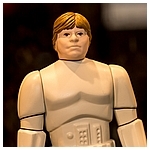 Nothing new other than a review of previously announced upcoming products including the unpainted prototype of Jedi Luke Skywalker. They announced they will have products from The Last Jedi but could not show anything. Gentle Giant showed off the convention exclusives once again. Then they wowed us with the new Jumbo line characters including Luke Skywalker in Stormtrooper Disguise from the Power of the Force line and the Emperor's Royal Guard. Lastly, they showed the jumbo early bird kit, which feature the full cardboard backdrop, stickers, and mailaway card. EFX lets us know that they obtained the rights to support the new films. 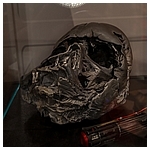 They also announced that they will be picking up products from the Prop Shop license and are beginning work on the burnt Darth Vader helmet. 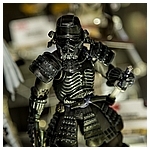 Tamashii Nations, short on time, quickly showcased some of their products and discussed what was next. They told us about how the lead designer loves creatures and had a fisherman father.. 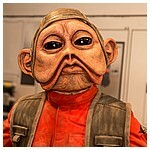 This lead to the reveal of the Admiral Ackbar movie realization. Bandai told us about their time at Skywalker Ranch and how they got to research the A New Hope Millenium Falcon. 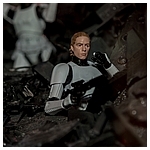 They took over 3800 photos of models from the archives and determined about 38 percent of the production models used parts from old Bandai models. Bandai was able to track down these kits and make other parts to make an extremely accurate reproduction of the Millenium Falcon. The big reveal from ANOVOS was the definitive mandalorian jet pack kit. 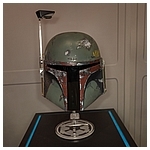 This was made from reach in the Lucasfilm archives and features all the parts you would need to make a Boba Fett jet pack from any movie and a Jango Fett jet pack. You could also make whatever you decided. 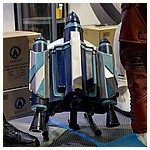 ANOVOS said this will be the last jet pack you ever buy. 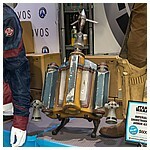 Unlike other jet pack models this one has the actual mechanism inside captured from the archives and is visible to you. Mannequins Of Masked Characters From The Force Awakens Help Lucasfilm Reveal Jack All About The Last Jedi To The Crowds At SDCC! 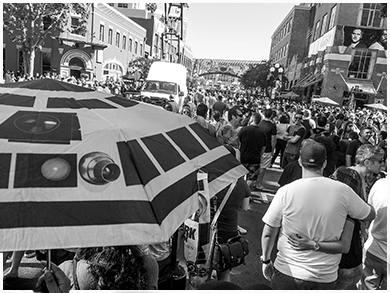 In the heart of the 2017 San Diego Comic-Con Star Wars pavlion, Lucasfilm set aside a decent square footage of space to a photo opportunity display that promoted The Last Jedi. Included in this display were the fully costumed mannequins of Resistant heroes Poe Dameron, Nien Nunb, BB-8 (prop, not a dressed mannequin, 'natch), and (technically a) newcomer C'ai Threnalli set against a Resistance base backdrop. 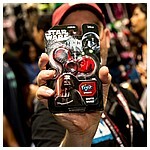 Uncle Milton's 2017 San Diego Comic-Con booth had many of their Star Wars Science items on display, but the first wave of their Star Wars Fijix spinners stood out as the the one item most visitors were interested in discussing. 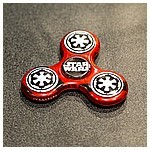 THe first wave of spinners includes Darth Vader, Boba Fett, R2-D2, and Stormtrooper. 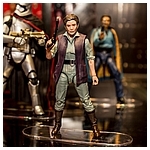 Those that need to collect them all should take note that Luke Skywalker and Princess Leia will follow soon after the first four's August release. 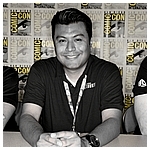 2017 San Diego Comic-Con Special Feature page edited by D. Martin Myatt. 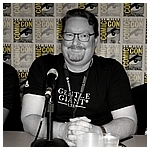 The LEGO portion of this feature was written by Jeremy Beckett. All other text and all photographs on this page by D. Martin Myatt, Adam Lamping, & Nick Napoli.